Groups Import Export is an extension for Groups, providing import and export facilities. This extension is now available in the Shop. Is that add-on still maintained? Or is it possible to import capabilities directly in my database? I can’t find in the database how user are assigned to groups? yes, the plugin is maintained. In the database, you have the table wp_groups_user_group that contains the relationship between groups and users. please help, i have to export group users almost on daily basis and i want to export specific columns (starting with billing_). Is there a way to avoid deleting all the unnecessary columns from groups-user-export page? 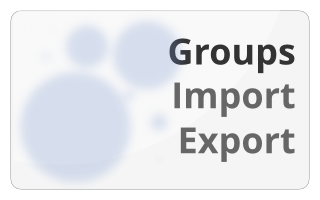 please open a topic in the Groups Import-Export forum. be sure your role has the correct permissions in Groups->Options. It does….but it’s a role created by “User role editor”. Do you believe that it’s not compatible or the role needs a specific capability from role editor? Have you tried to select ‘groups_access’, ‘groups_admin_groups’ and ‘groups_admin_options’ custom capabilities in Users->User Role Editor ? Is this plugin integrated with Active Directory Integration Plugin , because they do have a bulk import option , and if i import a group will it automatically sync with the group made with your plugin. Or pls suggest me what do i do for this. 1.- Destinations groups are selected in the settings (not in the file). You could create different import files according to groups (one file by group). 2.- Right now there isn’t an interation with Active Directory plugin. Just get this plugin and it is not useful. It dont update user groups when user exist, just skip it. If I want to get plugin to only import new users, there is plenty of them free and using standard csv files. There is not plugins to import groups and insted of being able to use this one, I will need to make one myself… Or am I missing something? If you’re suggesting that we allow to update existing users with groups indicated in the CSV file, then that’s something I’d be happy to include. This has been added to the latest release which allows to update existing users. Thanks for your suggestion, you’ll find the updated version in the Downloads section. Hi, some parts of your plugin doesn’t work. I have some suggestions for fixes. How can I send them to you so you can consider them for the next version of the plugin? you can send us your feedback to support at itthinx dot com and we’ll have a look. Please, is is possible to add extra fields, such as: telephone, address, city, company and upload such data into woocommerce tax invoice customer details? sorry, this plugin can’t be used to import/export Woocommerce invoices. I just purchased your plugin. names with special letters are not being uploaded or displayed at all. Hello. I also have problem with the special characters. I use UTF-8 but still åäö gets. For example Ä gets Ã¤. Any idea how to solve this? Please open a topic for this and post an example in the Forums of what you have exported or are trying to import so we can test it.